Enough pretty (at least for the moment). How about something quirky? 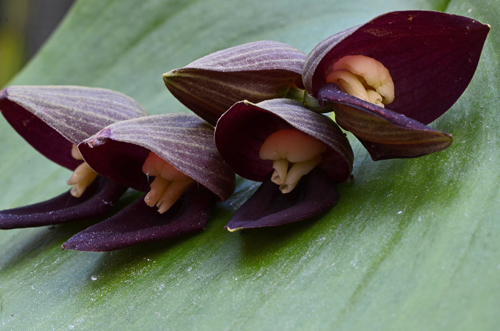 The orchid family is, after all, huge. Would we really want everyone in our family to be a beauty contestant? 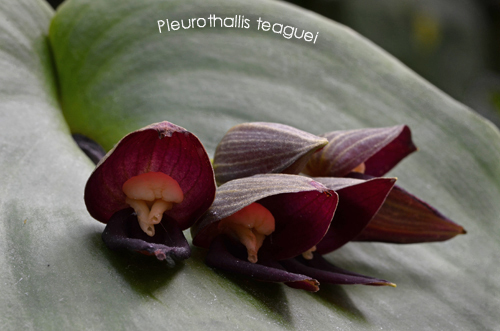 Pleurothallis teaguei somehow manages to be simultaneously quirky and wonderful. It has heart shaped leaves the size of salad plates, with flowers bursting from (what appears to be) the center, like some weird bouquet. 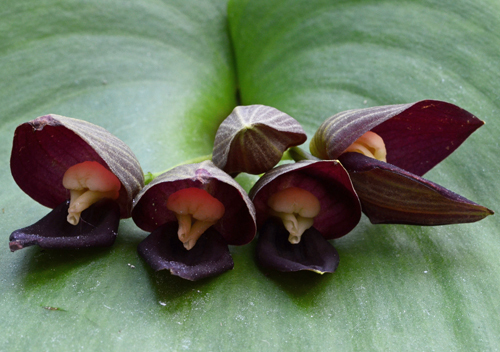 And like many of the Clamshell Orchids (Pleurothallis section macrophyllae-fasciculatae), it produces a bouquet every time a new growth matures, which can be several times per year. The warm growing Pleurothallids are easy to grow here in Atlanta. They're at the low light, high moisture/high humidity end of the cultural spectrum. Once established, they hate root disturbance. Uproot an established plant, and you can expect to wait years for forgiveness. 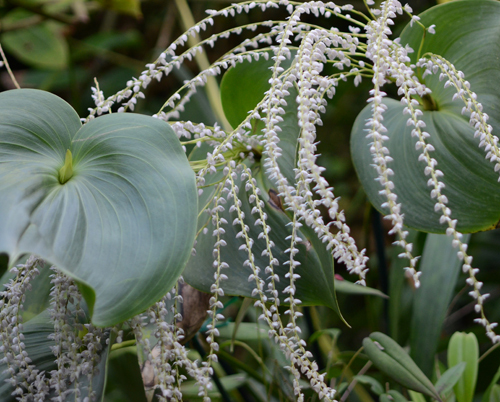 We've planted a number of the larger Pleurothallids around the Tropical High Elevation House. Though they are epiphytic, they are also perfectly content planted in a conservatory bed in a well drained mixture of fir bark, charcoal and permatill. They grow equally well in pots in a mixture of long fibered premium sphagnum and chopped tree fern, or as epiphytes mounted on larger trees.